If you’ve reached the fourth decade of life, you may have begun to notice vision changes or may have experienced other eye-related issues largely associated with growing older. Just as aging results in changes within the body, failing eyesight and a decline in eye health and function is not uncommon. Risks for developing eye and vision problems include smoking, a family history of glaucoma or macular degeneration, chronic conditions such as diabetes, high blood pressure and high cholesterol, as well as certain medications, visually demanding work and hazardous occupations. 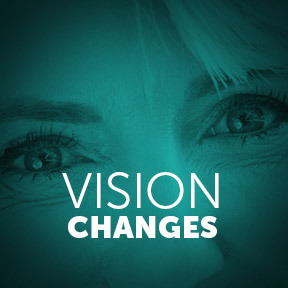 Common vision changes, such as presbyopia, changes in color perception, reduced tear production and a greater need for brighter light, are considered normal. However, vision loss, glaucoma and age-related macular degeneration are not. Presbyopia, a reduced ability to focus, can be corrected with eye glasses or contacts, and a need for additional lighting for reading or close up work can be easily accommodated. Impaired tear production, known as dry eye syndrome, often results in uncomfortable symptoms of dryness, irritation, grittiness, burning, excessive tear production and potential vision loss. Proper hydration, whole food nutrition including fresh fruits, colorful vegetables, moderate amounts of fatty fish, and a daily intake of key nutrients can help to alleviate symptoms of dry eyes and decrease the risk of developing other eye conditions. In surveys baby boomers choose vision as the most important of all five senses, although surprisingly many appeared unaware that key nutrients play a critical role in eye health and maintenance. Inflammation and reactive oxygen species, or free radicals that can damage DNA, RNA, proteins and other molecules within a cell, are often implicated in the etiology, or cause of disease. Diseases of the eyes are no exception. Per the National Institutes of Health (NIH), there is evidence that dietary antioxidants and anti-inflammatories may provide benefit in decreasing the risk of age-related eye disease. Nutrients such as antioxidant vitamins C and E, beta-carotene, zinc, lutein, zeaxanthin and the omega-3 fatty acids, EPA and DHA all play key roles in eye health. National surveys have found that intake of these key nutrients from dietary sources falls below recommended guidelines. Known as a highly effective antioxidant, vitamin C protects the body’s essential molecules, such as proteins, lipids, carbohydrates, DNA and RNA from free radical damage. Free radicals are generated through normal metabolism, as well as toxin exposure from pollutants and cigarette smoke. The eyes, in particular, have a high metabolic rate and therefore an added need for antioxidant protection. Actually a family of eight fat-soluble antioxidants, vitamin E is an integral part of all cell membranes that are highly vulnerable to destruction by free radicals. As the retina is highly concentrated in fatty acids, vitamin E has beneficial effects on ocular health through its ability to neutralize free radicals. As well, vitamin E has been shown to improve blood vessel dilation, which helps to decease blood pressure. Zinc is an essential component of many enzymes necessary for optimal eye metabolism. Zinc plays important roles in the structure of proteins and cell membranes, provides antioxidant protection, supports immune function and may also be involved in the formation of visual eye pigments in the retina. Although primarily a symptom of vitamin A deficiency, zinc insufficiency may also result in night blindness. Commonly found in orange colored fruits and vegetables, beta-carotene is the primary dietary source of provitamin A. Research and clinical studies have shown that beta-carotene plays a role in age-related eye disease prevention. Vitamin A deficiency is one of the most common causes of blindness worldwide. Insufficiency can also lead to night blindness and dry eye syndrome. Dietary sources of vitamin A are found in animal-derived foods as well as plant-based carotenoids that the body converts into vitamin A. Unlike beta-carotene, lutein and zeaxanthin are carotenoids that do not have vitamin A activity. Of several dozen carotenoids found in blood and tissues, only lutein and zeaxanthin are found in the lens and the macula, the central region of the retina. In addition to their antioxidant role, these macular pigments limit retinal oxidative damage by absorbing incoming blue light. Sufficient intake of lutein and zeaxanthin is associated with decreased risk of developing age-related macular degeneration. Omega-3 fatty acids have a number of actions relating to neuroprotective effects in the retina. DHA is found in high concentrations the eye where it may help to slow degeneration of the macula, the most common form of vision loss in older persons. 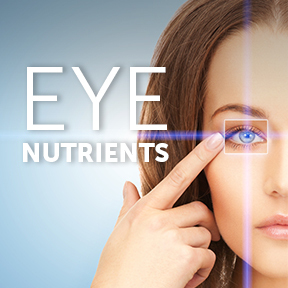 Clinical Nutrients™ Eye Formula by Integrative Therapeutics®: This professional formulation is designed to provide specific nutritional support for proper eye function. Ingredients include vitamins A, C and E, beta-carotene, zinc, lutein, turmeric and bilberry. Free of sugar, salt, wheat, gluten, yeast, dairy and artificial colors, flavors and preservatives. VisionPro Nutrients® by Pure Encapsulations®: This comprehensive, hypoallergenic multivitamin, mineral and polyphenol formulation provides nutritional support for eye integrity, normal tear production and healthy vision maintenance. Other ingredients include an eye protect complex and a macular synergy complex with lutein and zeaxanthin. 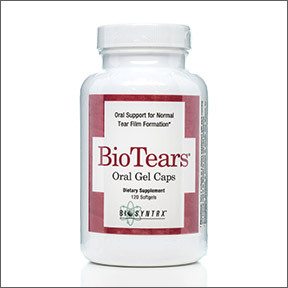 BioTears® by BioSyntrx®: This popular product provides nutritional support for normal tear film formation. BioTears® synergistic tear-specific formula includes nutrient cofactors that support the structure, function and production of eye lubricants. Ingredients include vitamins A, C, D and E, turmeric, black currant seed oil, EPA and DHA.